As the heat index rises in the valley, head north to Prescott Valley where the air is cool but the golf is hot! Situated on Bluff To p drive, there is no bluffing on this course. You want to bring your A-game for this sacred round of golf. Sacred, you ask? Built on traditional Native American land, respect for ancient burial grounds was a serious consideration in the way architect Randy Heckenhemper carved this course out of the desert canyons. A medicine man blessed each hole before completion. It was also a sacred round for all the “Thank Gods” expressed for lucky bounces, birdies and an eagle. Environmental washes posed an additional challenge to the course design, but resulted in a uniquely contoured layout that blends with the land. You feel a combined respect for the game of golf as well as past heritage, culture and the environment. The diversity of desert, valley and canyon landscapes, provide a variety of views and shot strategies. Above 5,000 feet in elevation, the opportunity for dramatically elevated tee boxes such as number 8’s par 3 can cause club contemplation when the “windage” consideration exceeds that of the elevation. 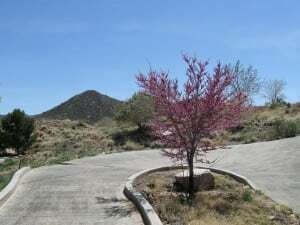 April brings the hope of spring with striking Redbud trees in full bloom, Mexican poppies and baby birds popping out along the way. Summer months provide the lush green freshness you long for in the hot valley south. Hole #5, par 4, 383 yards – Heed the GPS tip on this hole concerning premium placement. The large landing area is deceiving since it slopes and then narrows to a small green guarded by a river wash and ravine. Shaped like an enlarged comma, this hole can produce expletives from players. 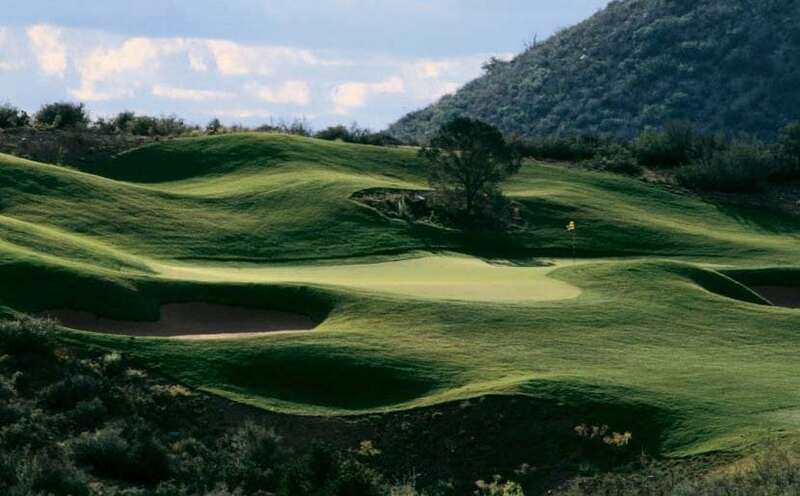 Hole #9, par 5, 575 yards –This uphill par five is separated by a sizeable ravine. The big hitters can ease up to the large wash if they perfectly place the ball on the left side. Anything right will disappear into the desert as the fairway slopes in that direction. It requires another uphill carry to a small two tiered undulating green with hillside bunkers for protection. This must be a target approach shot to have a prayer of paring the hole. Hole #15, par 4, 376 yards Think of the high banked curve of Talladega race track and you have the picture of this fairway. Hit from any tee box hard into the left side hill as it will again slope to the fairway and provide an easier uphill battle to the elevated green. Hole #18, par 5 630 yards – From the tips, this is the mother of all finishing holes. The S shape from tee to green is due to the earlier mentioned consideration of burial grounds. Ladies get a huge distance advantage on this one, but the shots have to be carefully placed to optimize the downhill roll. Second shots to the green are possible but require the best of execution. Even a good tee shot could be blocked by the trees that border the ravine to the right side, questioning an attempt to reach the green in two. Beware the false front of the green if you get close. Make sure your chip shot will reach the table or your ball will roll back to you and cause repeated chipping until you do. A good score on this hole is as satisfying as golf can get. The positive thought on the tee or fairway for many holes on this course should be “canyon carriage!” It is a big hitter’s delight, but aesthetically and mechanically fun for all. Open to the public at reasonable rates, memberships are also available. Check out what specials are offered. Showing on our cart was Sunday brunch and 18 holes of golf for $40, a no brainer deal. Head Pro, Denise Hyman has a lovely smile that expresses her passion for golf and this particular course. The full service shop has a nice selection of attire, accessories and authentic art at reasonable prices. The restaurant is cozy with a large outside patio providing panoramic views to make any event memorable. Individual character of each and every hole makes this course a blast to play. Try it and you will want to come back again and again.